I don’t know if you are familiar with Time-Warp Wife yet, but I am a subscriber of this blog and it is my favorite! You will find inspiration, encouragement, and truth as you read through her blog posts! Darlene Schacht is a wonderful woman of God that insipres not only me, but thousands of other women out there who desire to be all that God has called them to be in the ministry of their homes! 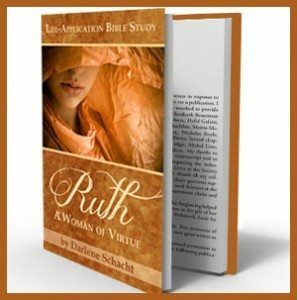 Enjoy an in-depth study on the book of Ruth. Learn about the relationship between the Moabites and the Jews and the underlying conflict between the two cultures. Dig into scripture as we talk about Levitical laws and customs of the day. If you would like to download a copy of this eBook, “like” the Time-Warp Wife Facebook Page! If you do NOT have Facebook, don’t despair! If you subscribe to her website (you will be so happy that you did), she will give it to you, you just have to email her through her website! After you LIKE Time-Warp Wife on FB, find the link called, “only likers” that is located just under the header. If you want to get the PDF onto your Kindle, youcan simply email the PDF file there. You might also find bygoing to Home > Menu > Settings > Device Email. Note: You may need touse the next page button to scroll down to the Device Email section. * This is an updated and reformatted version of the Bible study that was published on the blog in 2011.